On Sunday, November 25, 2018, a ship of the Border Guard Service of the Russian Federation’s Federal Security Service rammed through a Ukrainian tugboat “Yany Kapu”. Along with two small artillery boats “Berdyansk” and “Nikopol”, it was executing a planned sail from Odesa to Mariupol, in compliance with provisions of all applicable multi- and bilateral international treaties and the navigation rules. 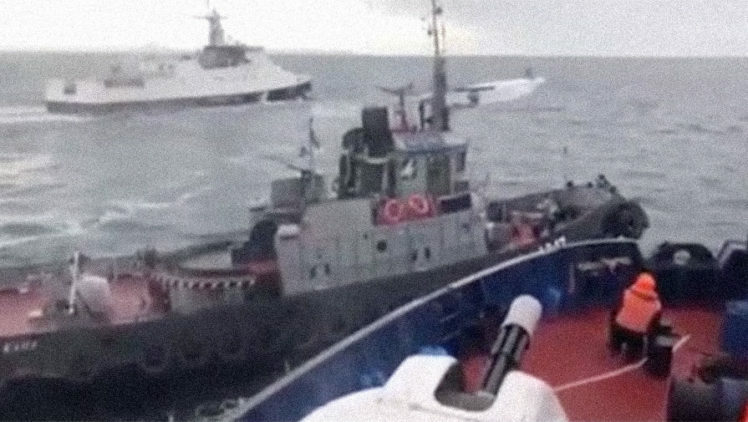 Later the same day, as reported by the press center of the Naval Forces of the Armed Forces of Ukraine artillery boats of the Border Guard Service of the Russian Federation’s Federal Security Service opened fire to destroy a fleet of ships of the Naval Forces of Ukraine. At that moment the fleet has exited the Kerch Strait to the Black Sea and was returning to Odesa. As a result of the attack, six servicemen of the Naval Forces of Ukraine were injured and 23 were captured. All three ships were forcibly towed to the temporarily occupied town Kerch of the Autonomous Republic of Crimea. Ukraine lost contact with them. Later, the Federal Security Service of the Russian Federation confirmed the use of weapons and reported providing medical assistance to three servicemen of the Naval Forces of Ukraine. Additionally, the Federal Security Service announced opening a criminal case regarding an alleged violation of national borders of the Russian Federation. Their opinion is that the Ukrainian ships “unlawfully entered temporarily closed territorial waters of the Russian Federation”. We would like to bring to your attention that a wide-ranging series of documents promulgated by the UN articulate its support for independence and territorial integrity of Ukraine, as well as acknowledge Ukraine’s sovereignty over the Russian Federation-occupied Crimea and its part of the Black Sea and the Sea of Azov. We emphasize that Ukraine has been guaranteed unhindered access to the Black Sea and the Sea of Azov, as well the Kerch Strait under international law, particularly the Charter of the United Nations, the 1982 UN Convention on the Law of the Sea, and the 2003 Agreement between Ukraine and the Russian Federation on Cooperation in the Use of the Sea of Azov and the Kerch Strait. The Russian Federation is not entitled to arbitrarily block such access, as it has previously done in the Baltic Sea Vistula Lagoon against the Baltic states and Poland. We consider these actions a worrying sign of escalation in the ongoing military aggression by the Russian Federation against Ukraine. They demonstrate that the deteriorating security situation in the Sea of Azov had reached a dangerous conflict level within Europe. We urge members of the UN Security Council to demand at its emergency meeting on November 26, 2018 that the Russian Federation immediately stop military aggression against Ukraine, release captured servicemen of the Naval Forces of the Armed Forces of Ukraine, recognize their status as the prisoners of war according to international humanitarian law and close all criminal proceedings against them as those contradicting international law. Also we call on the UN Security Council members to demand that the Russian Federation give detailed information regarding physical condition of captured servicemen of the Naval Forces of the Armed Forces of Ukraine, medical assistance provided to the injured, grant access to them for official representatives of Ukraine and international non-governmental organizations, as well as restore Ukraine’s control over the captured vessels and compensate for the losses.